The borders actually go by pretty quickly once you sit down and make yourself do a few of them at once. There’s no way I’m making my self-imposed end-of-July deadline on this blanket. Also, I’ve reached the point in the project where, if this were a sweater, I would be heavily browsing new sweater patterns and sifting through stash yarn for my next sweater project. Probably even winding up the yarn and putting it in a nice project bag all set to go. 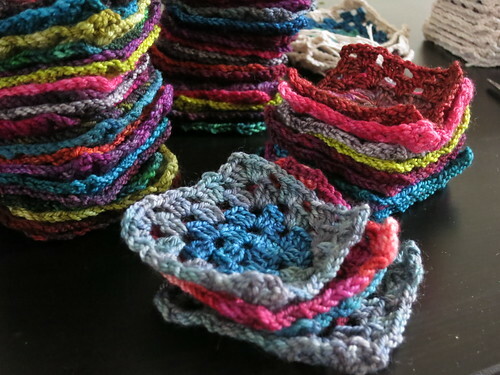 True to form, the other day I took out some yarn for a future Pi Shawl (Ravelry link) and put it out on the coffee table – you know, because when you’re struggling to finish an enormous project, what you really need to do is set yourself up with another big enormous project. Also it’s just about time for my annual Pi Shawl cast-on. (One a year 5 years in a row and going strong). I haven’t wound up the Pi Shawl yarn yet, but that might just happen pretty soon. 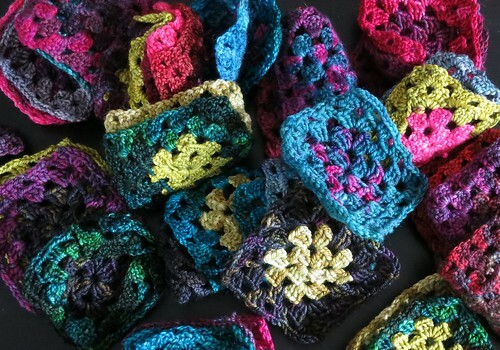 Anyhoo, back to the granny squares. If I hadn’t had the 2 month hiatus back earlier this spring I think I might have made it, but let’s face it that hiatus was also pretty much required after the efforts of getting 340 individual squares. And I’m a good way into the borders, but I haven’t been exactly sure how long I have left to go. So, when in doubt, count, I say. All in all I’m still okay with this. The main thing is to just keep going, which is always the thing, really. In the end I’ll get a kickass blanket. Onwards! Play with some fun yarn today. Yarn: Miscellaneous sock yarn stash leftovers, including Tanis Fiber Arts sock, Blue Moon Fiber Arts Socks That Rock, Madelinetosh sock, Dream In Color Smooshy, Van Der Rock sock (no longer available), Indigodragonfly sock, Miss Babs sock, and more. Border yarn is Sweet Georgia ‘Tough Love Sock’ in birch. 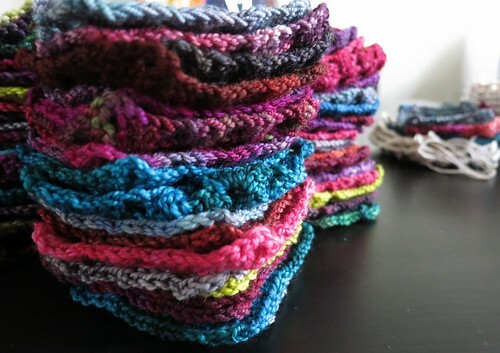 Squares done by end of July seems perfectly reasonable to me, as is setting up a project bag for the next project…. I can almost see the finished object while squinting. I wound a couple of skeins for a new project and let them sit, tempting me. I caved in last night and did a swatch. But, I WILL get back to the current sweater nearly done!! It’s almost there and so are you! Can’t wait to see this granny! I think you learned the most important lesson we can all learn. JUST. KEEP. GOING. even if you only do one square some days, just keep doing it and it will suddenly be done. Time for another Pi shawl already? Wow! Time flies. I can’t wait (but I will!) to see what you do wit this one. One thing I’ve learned about big projects is, you never want to figure out how much is left to do until you’re on the back stretch. So, good move there. And if those pictures are even remotely accurate, you are going to have a spectacularly beautiful blanket when it’s done. Plus, even in Canada you can’t really NEED that blanket by the end of July. I cant wait to see the finished project. I hate having time off, had knitters elbow and I am just now getting back into the swing of it. Eh. Too hot to wrap up in it in July anyhow 😅😅It’ll get done in time for the cold! This is going to be the most epic blanket. Go Glenna!! You also reminded me that I really want to make a Pi Shawl but then I remembered that I got the craziest idea to knit only Lord Of The Rings inspired projects next year & there’s WIPs to finish & a KAL to join.